We bring you the parts you need when you need them! If you think all salvage yards are the same, think again. Smith Auto & Truck Parts is different for some very important reasons, the most important being you. Our commitment to outstanding customer service drives every action we take. We never stop looking for ways to improve our quality, delivery and inventory. We also handle a full line of NEW aftermarket hoods, fender, bumpers, headlamps, tail lamps, grills, radiators and a/c condensers for your late model car or truck. You can buy from Smith Auto & Truck Parts with confidence. The parts you get from us have been cleaned, tested and inspected. They come with our promise that you’ll be satisfied! 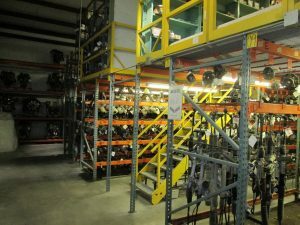 With 1,500 units on site and 100,000 parts in our computerized inventory, we have just about anything you need for your late model car or truck. If we don’t have your part we can find it for you with our FREE nationwide parts locating service. Smith Auto & Truck Parts is your alternative to the high cost of new and rebuilt parts! Shop and compare! Depend on us to deliver clean, top-quality parts, every time, and on time. All our parts come with a 90 Day Standard Warranty. We offer extended warranties at an additional cost.